See the cows being milked, then enjoy some of that milk (plain, chocolate or coffee milk) at one of their picnic tables. This may seem strange, but I don’t like cake. I do make an exception for a perfectly conceived cupcake, but I never order it at restaurants, and I always pass on it at weddings and parties. So recently at a 4-year-old’s birthday party, I instinctively replied “no thanks” to the offer of cake. But when I learned that it came from Wrights Dairy Farm, I immediately admitted I had made a huge mistake and got myself a slice. And yes, the cake from Wrights Dairy Farm lives up to its reputation — soft, buttery and layered with real whipped cream from their very own cows. 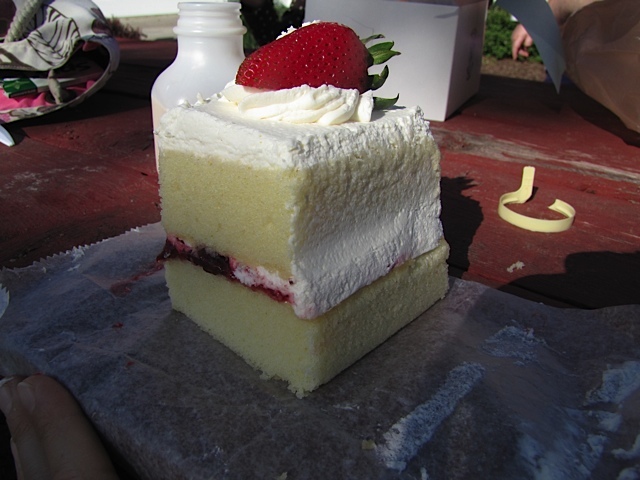 The cake at Wrights Dairy Farm -- I wish I were eating it right now. A few days later, we were at the farm, admiring those cows. 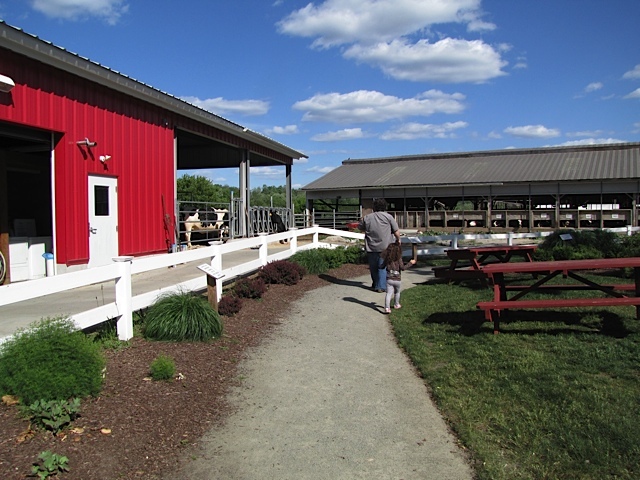 At Wrights Dairy Farm, you can watch the cows being milked every day from 3-5 pm. As we watched, I realized I’d never actually seen a cow up close being milked by a machine before, which is quite mesmerizing. Apparently, each cow provides about 5 gallons of milk during each milking — impressive output for a diet of corn and grass. We then made our way into their bakery, which displays an array of pastries, pies, cakes, cookies and more. Ultimately, I couldn’t resist the strawberry shortcake layered with whipped cream. And as I enjoyed it with a side of their own coffee milk on a sunny day at one of their picnic tables, I decided this is definitely one of my favorite excursions in the state. I enjoyed this post. It looks like the place for a perfect day out watching the cows being milked, and especially topping it off by being able to enjoy such great cake and coffee. My mouth waters. Visited the farm last weekend had a great time and the bakery is awsome! i have never been to the farm and i am planning to visit this weekend i was just wondering can the children actually milk a cow there? I don’t think you can milk the cows since it’s done by milking machines actually. However, there’s a set schedule, and it’s open to public viewing. I would call before you go so you can find out the best time to go to see the milking.